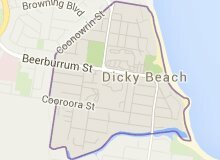 The use of the Dicky Beach Family Meats (AKA db meats) website is at your sole risk. To the full extent permissible by applicable law, neither Dicky Beach Family Meats nor its affiliates, nor any of their officers, directors, or employees, agents, third-party content providers, merchants, sponsors, licensors (collectively, "Providers"), or the like, warrant that the Dicky Beach Family Meats website will be uninterrupted or error-free; nor do they make any warranty as to the results that may be obtained from the use of the Dicky Beach Family Meats website, or as to the accuracy, reliability, or currency of any information content, service, or merchandise provided through the Dicky Beach Family Meats website. This site is provided by Dicky Beach Family Meats on an as "as is" and "as available" basis. To the full extent permissible by applicable law, Dicky Beach Family Meats makes no representations or warranties of any kind, express or implied, as to the operation of the site, the information, content, materials or products, included on this site. To the full extent permissible by applicable law, Dicky Beach Family Meats will not be liable for any damages of any kind arising from the use of this site, or from any products purchased from this site, including but not limited to direct, indirect, incidental, punitive and consequential damages. No oral advice or written information given by Dicky Beach Family Meats nor its affiliates, nor any of their officers, directors, employees, agents, providers, or the like, shall create a warranty or legal obligation; nor shall user rely on any such information or advice. Dicky Beach Family Meats reserves the right to change any advertised price before accepting an order. All products are subject to availability and may be withdrawn at any time. If we are unable to fulfil your order, you will be offered an alternative or given a refund for the unavailable product.